Off-road adventures come in all flavors. This one, came in what I like to call, iced quad vente, seven pump vanilla, caramel sauce top and bottom, light ice, half cream half virgin soy, extra whip, white chocolate mocha with peppermint sprinkles and just a hint of Madagascar cinnamon. Like a personal coffee order designed to test your barista’s patience and stamina, when it comes to off road adventures you can’t please everyone… so you got to go by your self. While sitting in the Toyota dealer’s service center I put together this run which would be a solo nighttime adventure through the high country of the Olympic National Forest out to Obstruction Peak. Of course by solo I mean with Hula Betty, she is after all stuck to the dash. Betty and I left for the peninsula around 7:00 p.m. cruising over the Hood Canal and jumping onto highway 101. As we followed the highway bypass, that now diverts you around Sequim, I sifted through the mental rolodex pulling up memories of trips with the kids that always ended at the Hi-way 101 Diner, a retro 50s diner that serves just about everything including burgers, grill cheese, pizza, meatloaf, real malts and ice cream sundaes served in old fashion glass boats topped with chocolate sauce and a cherry. The kids still tell me the 101 Diner is the best. It is amazing what they remember from when you were three. 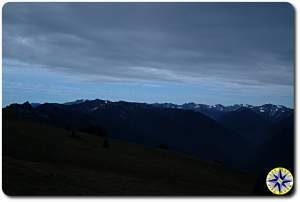 The road to Hurricane Ridge starts on the outskirts of Port Angeles. Another ritual the kids and I would follow on winter sledding trips was to stop at the Olympic National Park Visitor Center. Betty and I made that stop. 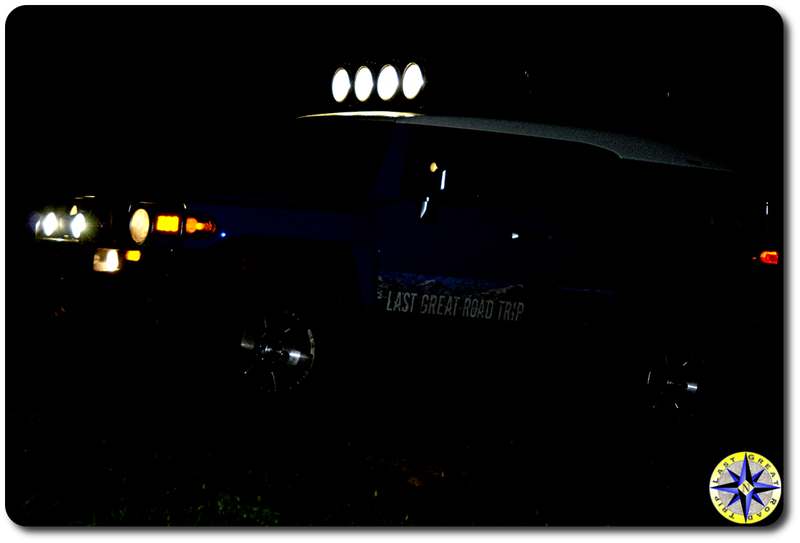 Not to look at the exhibits or get trail condition reports, but to check the lugs, verify fluid levels and test the lights before heading up to the Heart O’ the Hills, the North East entry point into the park. Last winter’s record snow fall has played havoc on the roads. 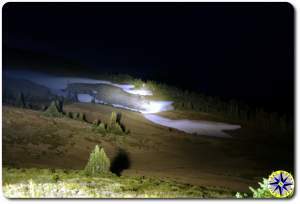 The normally placid tarmac from the entry to the Hurricane Ridge Visitor Center is in the middle of a complete face lift. 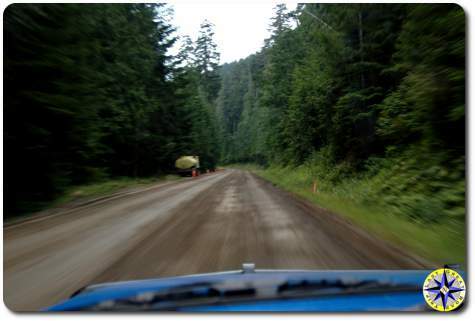 Navigating to the top involves moving from asphalt to gravel, from two lanes to one and back again. 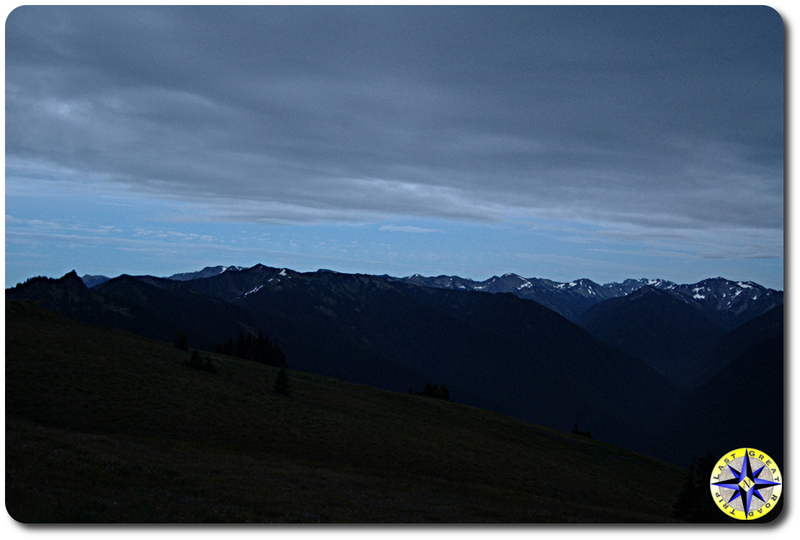 Luckily at 8:30 p.m. traffic was off the mountain and we zipped up to the Hurricane Ridge Visitor Center parking lot. Pulling into the lot, I immediately spotted one of the reasons I picked this trial, dear. Several of them were wondering the meadows as the last rays of the sun filtered through the surrounding peaks. Gazing over the blanket of wild flowers Hula Betty and I watched as the last visitors and the sun left for lower elevations. I’ve hiked from Dear Park to Obstruction Peak, I’ve driven the dirt road that takes you to Obstruction Peak, I’ve even snow shoed a portion of the way. But I have never gone that way in the dark, by myself. As the tires slowly rolled from the tarmac onto dirt, the clouds only yards above us, began to release their hold on the moisture captured from the sound a few miles away. Rolling down the dirt trail with a lite rain, soft breeze and only our own lights to guide the way, gave Hula Betty and I plenty to think about. This is not a technical drive. This was my opportunity to clear my head and enjoy the sights and sounds of the night. Keeping the speed down to avoid the dear who occasionally bounded up the hill and across the road, reminded me how lucky I am to live within an hour and half of this magnificent forest. As we (yes I know Hula Betty is not real, but she is a great listener) rolled past the PJ Lake trail head I smiled at the memory of lunch with the family at the lake nearly 10 years back. Easing past the trail head we started to climb above tree line and came upon a turn out that allowed us to look down and see the lights of Port Angeles below and the faint glow of Victoria, Canada in the distance. Winding little switchbacks took the rig higher where we spotted patches of snow clinging for life in the shadows of the slopes. The last few block of the dirt road feel like a moon scape in the dark. You wind back and forth, up and down the hills that take you up to Obstruction Peak, 6,450 ft above sea level where we started. 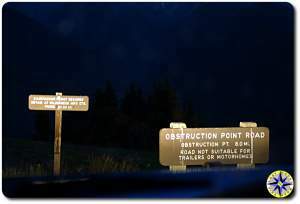 There is no over night camping at Obstruction Peak, but the parking area held a dozen or so all wheel drive cars and trucks belonging to backpackers who had escaped into the hills. The trail head signs talk about bear and cougar that frequent the area and although I had seen a number of dear, no carnivore sightings. Hoping to catch a glimpse of a bear I wondered about looking across the high meadows to the cloud covered peaks when the rain started to gain strength driving me back to the shelter of the rig and Hula Betty’s company. It was at that point I realized I had driven and walked around for six hours without exchanging a single word. My thoughts, memories and the natural sites had me engaged throughout this little Zen meditation run. Heading back down the 7 mile dirt road, gravity and a foot on the gas ramped up the tempo to a brisk drive. 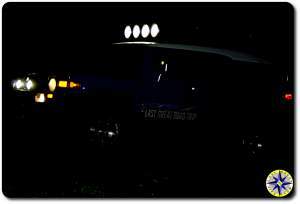 The lights provided visibility, which seemed to reach around the corners, allowing us to scoot down the road at a healthy pace. Healthy enough to set off the yaw detector alarm once. The dirt road quickly came to an end as the Rig returned to the Hurricane Ridge parking lot we started at a few hours earlier. Letting gravity control the pace, the drive down to the Hart O’ Hills entrance ebbed and flowed with the steepness of the decent. Entering Port Angeles’ city limits, the lights I’d seen from above were now the hustle and bustle of McDonald’s, Safeway and the other trappings of ordinary life. The drive home continued the casualness that marked this evening. Rolling over the Hood Canal Bridge the water sat still in the glow of the bridge reflecting the billows of the clouds above. The last turn off the highway signaled the return to home. Pulling into the drive way I lingered in the driver’s seat for a moment or two enjoying the moment and planning the next off road adventure drive. Dear Park at night could be fun. Really? That’s your coffee order?